Things you should know about Twitter for Marketing. Twitter - a prominent social networking media, as we all know it stands next to Facebook on the verge. It is a powerful marketing strategy. For those who don't know much about Twitter, it provides a wide range of contacts to your business. There are quite a few things you need to know about Twitter before you value it with other social networking sites you use for marketing. 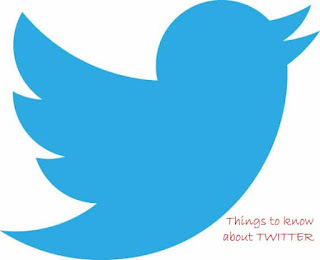 Recent Surveys provide a popular fact that Twitter shares about more than 350 million Tweets everyday. The Internet Browsing activity is mostly through moble devices rather than PC's and Laptops. Among this crowd, more than 40% percent tweets with links, share videos via youtube. In short more than 40% of people use Twitter for Branding their products and marketing (Self-Promotion). It is a powerful tool for sharing more than Facebook and other social networking medias. The prospective is that it is likely to increase the tweets in the nearby future. The 140 long character tweets have a great impact with specified keywords rather than sharing a big essay or posts. Twitter can provide you more traffic to your blog. The major aspect of Twitter is that there is always increase in followers. For example, You follow 200 people a day and it is quite a fact that least 20% of the followers will follow you back on twitter. You will never be out of followers unless you unfollow people who followed you. What I said does not apply to "Verified Accounts". So, when they follow you, your tweets are all over their Twitter "stream" and vice versa, their tweets on your stream. Lets say, You tweet 10 tweets a day, it is not likely that all of your followers will have a chance to view your tweets unless they come visit your twitter profile and that is not going to happen at the start anyway. So, say you have 1000 followers and least of 30% of your followers will have a chance to view your tweets. And 10% among the 30% will read your tweet headlines clearly and if they are interested, they might click the link and visit your blog. For more traffic to your blog through Twitter you will need to have atleast some followers who are interested in your field. For example, if you tweet about bikes and cars, you will need your followers to be interested in bikes and cars too. If they are too, then there might be a chance they will have a peek at your tweets. So, You need to find followers of your category. I'll ask you to try out some Twitter tools that will get you followers of your kind. Try some tools like Tweepi, Twellow etc. This will fetch you followers of your category. Follow the people like you and wait for them to follow you back. Like I said, Mostly do not expect all of the people you followed will follow you back. Some will not follow you back and Some will follow you. So, you'll get your followers of your kind and Tweet as while you can but remember tweet constantly. Do not let go off after tweeting for some days and make a long gap. Chances are likely that many of your followers will have a glance at your tweets. Only doing all the above is not enough. I said there is only a chance. You have to work for it. Interact with other fellow people like ask and answer questions, tweet them with @mentions, organize groups, communities etc., learn ideas. Twitter's LIST will help you do that. Add your blogging followers to the lists and Interact with them constantly. Appreciate each other's work. Retweet your follower's tweets. Blogging is all about Interaction. The more you interact, the more Ideas overflow . Blogging is a field where you can keep on learning. Twitter is a place where you explore contacts and as much you explore as much you can learn from others.